Mayor Rahm Emanuel has a strange habit of hiring people from outside Chicago to run the city of Chicago. His police chief was from New York. Both of his appointed schools chiefs were alsofrom New York. In the days of the old Daley machine, Chicagoans ran Chicago, and the patronage stayed mostly within city limits. Much of Democrat Rahm Emanuel’s electoral war chest came from the coasts, including$1.5 million total from Hollywood (where Rahm’s brother Ari is a fancy shmancy talent agent) as well as from east coast tycoons like Donald Trump — a Republican — who threw $50,000 at the Chicago race. The problem with hiring outsiders is that Chicago is a large city that takes years, not minutes, to fully understand. Did Superintendent of the Chicago Police Department McCarthy really understand the streets before taking his post? …[T]wo months after McCarthy arrived, the murder toll–the stat by which police superintendents are most judged–began to inch upward. And after a brief winter respite, violence surged in March of . Through June 17, police reported 240 homicides, a 38 percent increase over the same period in 2011. The situation is particularly worrisome in light of statistics that show the number of murders and shootings starting to level off before McCarthy and Emanuel took over. The outsider schools chiefs did no better. Former schools CEO Jean-Claude Brizard led negotiations for the Chicago Board of Education, which led to the first teachers strike in 25 years. And his replacement, CEO Barbara Byrd-Bennett, is leading the charge of closing 61 Chicago Public Schools, a move that will force students to cross gang lines to get to school, will break up communities, and ultimately may cause the worst schools crisis in Chicago history. These are not the moves that people who understand this city would make. 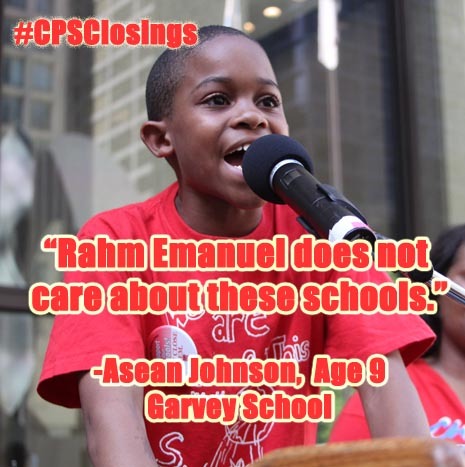 The school closings wave is at the crescendo of years of slow and steady sabotage by the Chicago Board of Education. If we think there’s a chance that a building is going to be closed in the next five to 10 years, if we think it’s unlikely it’s going to continue to be a school, we’re not going to invest in that building. The very schools that needed the most support — libraries, small class sizes, and wraparound services — were starved, making a case for what may be the biggest school overhaul since Hurricane Katrina. Cawley will never have to put his own daughter through the mess of a school shakeup. At a time when CPS was cracking down on district employees who were found to be living outside city limits, Emanuel last summer endorsed a two-year waiver for Cawley, a Winnetka resident. Cawley had expressed concerns about becoming CPS’ top financial officer because his family had adopted a 12-year-old girl last year from Ukraine and were reluctant to uproot her from their North Shore community. CPS’ Inspector General called for the waiver to be rescinded and he was denied. The school closings advocated by the Board of Education will affect 30,000 students and parents — but not Tim Cawley, his wife, or his daughter. 30,000 lives will be uprooted from their communities. Apparently the Board of Education understands that moving students out of their home schools causes much pain and suffering, which is only acceptable for other people’s children. This entry was posted on April 3, 2013 by Kenzo Shibata in Uncategorized.